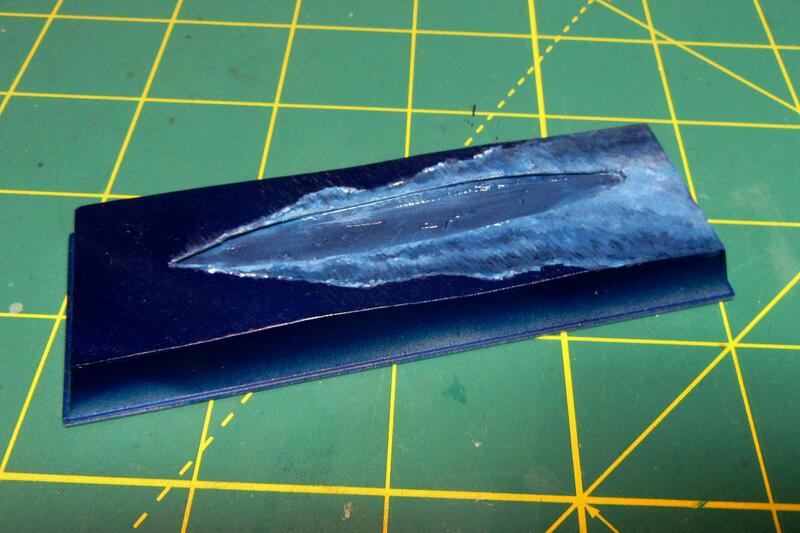 Painting of the sea base begins with a coat of Tamiya Royal Blue (X-3) acrylic. The sea received only a thin coating of the blue to keep from obscuring the delicate “wave” patterns stamped on the original paper. I’ll give this a day or two to cure before adding the wake. Nice paint job on the sea Tim. The deep blue of the Pacific ocean, nice choice of color. that part of the ocean definitely looks nice!! Just can't get over how small she is! Thanks guys. Even though the initial coat on the base was acrylic, I used enamel paints for the wake. Enamels dry more slowly than acrylics, providing more time to work. I also find them easier to blend. Plus, if I screw things up, the wake can be removed with thinner without damaging the acrylic base coat! The ship and base are really looking great. Thanks for your explanations along the way. I learn a lot from watching from afar. Looking forward to more. Tim: What type of adhesive will you use to secure the carrier to the base? Very subtle work with the wake, looks very much in scale. I'll be adding some dabs of Liquitex gloss gel medium to give the wake some dimension; the stuff works great as an adhesive too. 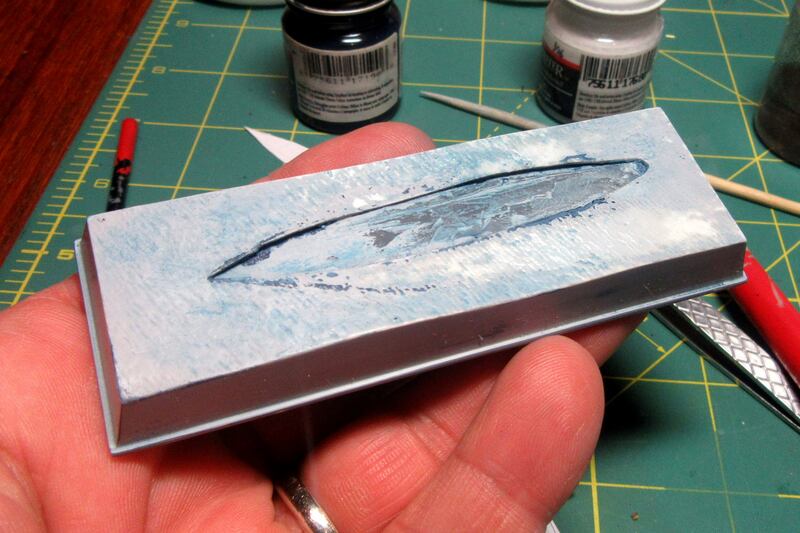 After getting the satisfactory wake above painting Ryujo’s sea base, I went back to touch it up a little before moving on to the ship... but instead of paint thinner, I inadvertently used lacquer thinner – with HIDEOUS results! The solvent thinned the white enamel paint all right, but it was so “hot” it also attacked the underlying acrylic coat! 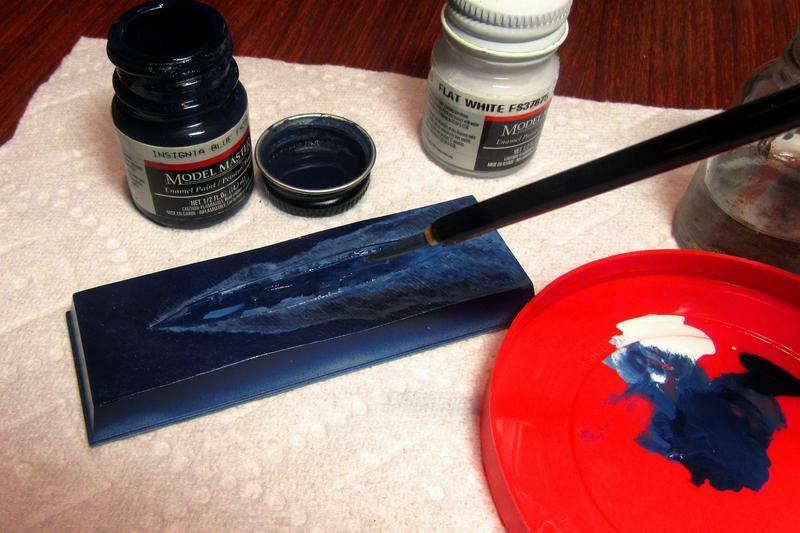 The blue acrylic paint came apart in revolting, gelatinous sheets... UGH. It is a real pain when something like this goes wrong. Tim: Assuming that you like myself like the little guys as modeling subjects, it is probably not a good time to tell you, given your recent sea base troubles, that Superior is issuing eight new destroyer molds in 1/1200 scale, including three IJN DD's (Kagero, Amagiri, and Yogumo) and five USN including three Fletcher variants,( Square bridge AAA upgrade, Square bridge mid war fit, and Pringle, a round bridge with a seaplane catapult) a Sims, and a Sumner. Each of them with feature new, more accurate, masts, as well as the main gun mounts as parts rather than being molded on, as was the previous practice. I have not seen these yet, and the information I just gave you is based upon a conversation I had with the owner of Alnavco/Superior, a friend of forty years or more, just last Thursday. More are planned. The new models are all fresh molds, and will be available after the first of the year. The hull and superstructure molds are already finished, awaiting only the masts and gun mounts. If you are interested I will keep you informed of the progress. Thanks, Chuck, for the heads-up on the upcoming Superior releases. I'll definitely check them out. And thanks, guys, for the commiserations on my IJN Ryujo woes. I'll get back at it and redo the ocean eventually, but right now I'm so disgusted with myself and that project that I'm going to switch to something else for a while. I find, when something goes a bit wrong, set the project aside for a bit and the love will come back. Aaargh! I feel your pain Tim! Gee talk about keep us hanging!! Did you break a mirror or something, 2 lots of bad luck with that base. Hang in there Tim, looking forward to the final result. Man that's too bad about the display base, it was coming out pretty well. Hopefully it comes out ok once you decide to come back to it. that's too bad!!!! I can feel your pain, and that you'll set this one aside for a while. But as I know you, motivation will come back, and I'll still be watching you then! Thanks guys! I don't really have my motivation back for this one, but I've re-sprayed the Royal Blue so at least I don't have to look at that mess of a base any more. Now it is back to uniform blue, waiting for the wake re-do. It also helped to turn back to the ship itself - shooting some grey did feel like progress! I intend to depict the ship as she appeared at the time of her loss at the Battle of the Eastern Solomons on August 24, 1942. The real Ryujo had just gone through a yard period from mid-July to mid-August at Kure, so the model was painted in Tamiya Kure Naval Arsenal Gray acrylic (XF-75). The gray was lightened a bit to adjust for scale effect, and a subsequent coat of Future floor polish acrylic will protect the paint and prep it for the flight deck decal and weathering to come. Nice to see some progress on this little gem again. Catzilla attack on the earlier post? thats funny!